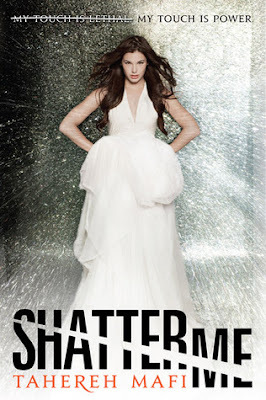 Shatter Me took me by surprise. Tahereh Mafi's novel is so beautifully written, her style so poetic, honest and captivating. Mafi has a way with words that sets her debut novel aside as utterly original and fresh. She touches hearts through Juliette's sweetness and light. Not to mention her strength. Through her eyes we see what beauty is left in a world changed for the worst, the grief of the many lost, and the strength of those who have the ability to change the world for the better. Juliette has been locked in an asylum for 264 days. She doesn't know what touch feels like. She's seventeen years old and been mistreated all throughout her life, but still believes in goodness of human nature. That not everyone she's ever come in contact with has an ulterior motive. It makes perfect sense that she forms a connection with Adam, the boy thrown suddenly into her cell and from a distant memory of her past. Their connection is intense and innocent to a degree. When Juliette learns from Adam that the Reestablishment, who is supposed to rebuild the world to its former glory, is living the life of luxury while citizens are oppressed and left with little hope, their budding relationship is pushed to levels of danger. Juliette's power may be deadly and rare, but I couldn't help but think of her as a superhero type. Omega Point, Juliette and Adam's destination after escaping the leader of Sector 45, is crawling with humans with a little extra supernatural in their genetic makeup. This addition to Shatter Me made me think of the X-Men, but with a dystopian element weighing on the plot. I feel ashamed that it's taken me so long to carve out time to read Shatter Me. Deep down I knew that genre-wise it was what I was looking for, and I'm pleased to say that it actually exceeded my expectations! Tahereh Mafi is a very refreshing author whose style will win with readers of all ages. I'm itching to see how she continues the series, because the stunning conclusion to Shatter Me has prepared me for anything!